21 Oct ’12 Filed under Blog, Food, Nature. Tagged environment, food. Bookmark the permalink. Post a comment. Leave a Trackback (URL). The study was done on land owned by Iowa State University called the Marsden Farm. 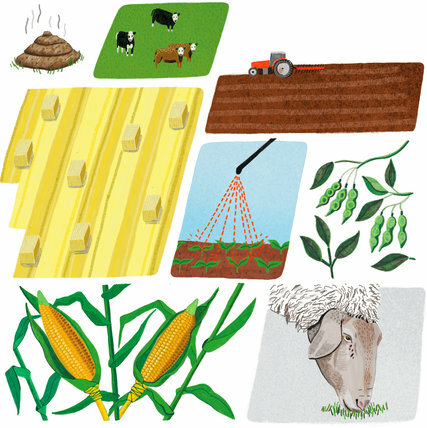 On 22 acres of it, beginning in 2003, researchers set up three plots: one replicated the typical Midwestern cycle of planting corn one year and then soybeans the next, along with its routine mix of chemicals. On another, they planted a three-year cycle that included oats; the third plot added a four-year cycle and alfalfa. The longer rotations also integrated the raising of livestock, whose manure was used as fertilizer. The results were stunning: The longer rotations produced better yields of both corn and soy, reduced the need for nitrogen fertilizer and herbicides by up to 88 percent, reduced the amounts of toxins in groundwater 200-fold and didn’t reduce profits by a single cent.